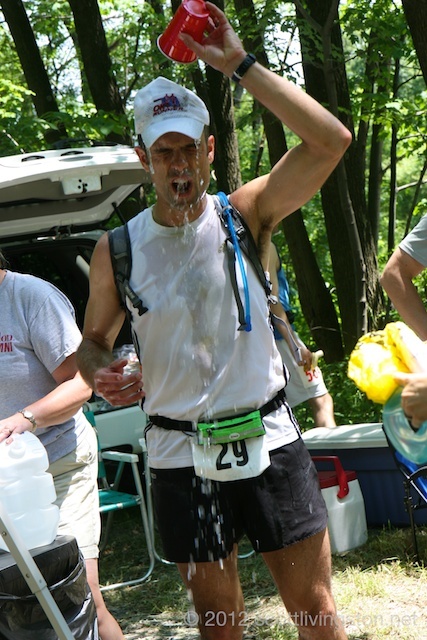 The 33rd edition of the Laurel Highlands Ultra was a fantastic race. This is the second oldest ultra in the country. I gather that only American River 50 is older. Debbie had a breakthrough run. She smashed the 22-year-old women’s course record, running 13:34:12 for the 70.5 mile point to point trail race in southwestern Pennsylvania. She was the fourth overall finisher, only trailing the top three men: Brian Rusiecki (11:30:37), Brian Krogmann (12:21:28), and Gregory Brant (12:56:45). The second and third women were Kaitlyn Kacsuta (16:02:08) and Robin Blendell (16:27:50). 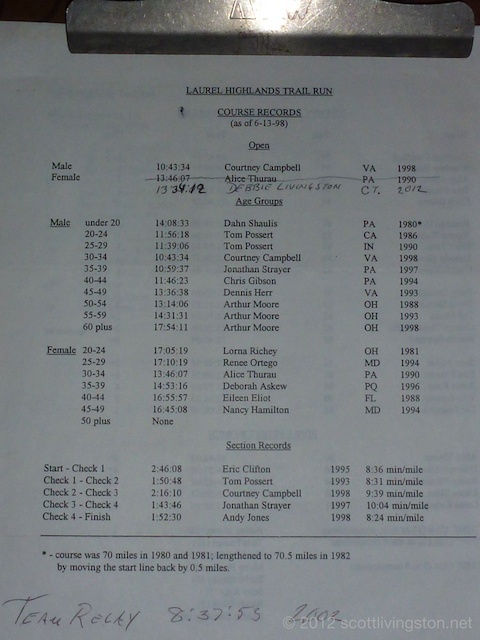 The previous women’s record of 13:46:07 was run by Alice Thurau in 1990. Naturally, I’m incredibly pumped up by her result. She pushed like never before. The result was a bit of a shocker for me. The kids and I crewed for her all day long. 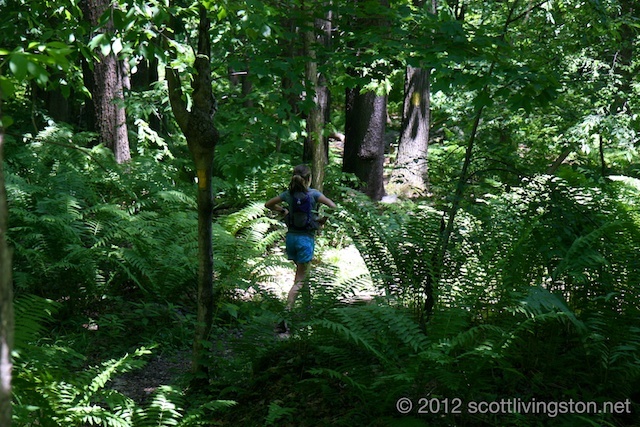 We followed her on the epic point to point course from the start in Ohiopyle to the finish in Seward. 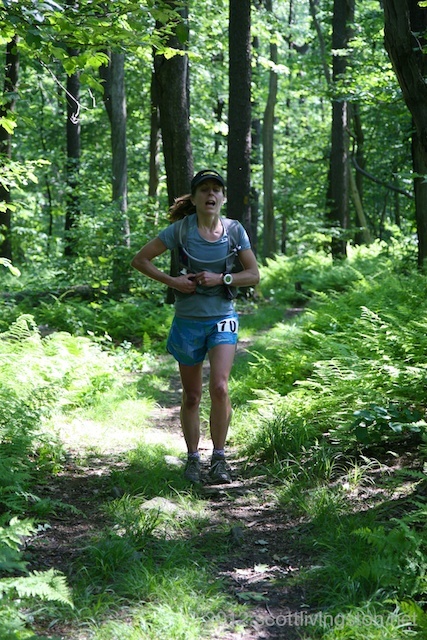 At the final crew accessible aid station at mile 57, she was in a very low spot. On the verge of tears (from pain), she seemed to have gone deep into the red zone. I’ve only seen her in that condition a handful of times. One time, in France (and I’ll leave it at that! ), her race went downhill from there. This time, she persevered, pushed through the pain, and made use of the literal downhill last section of the course to hammer the last 13 miles. I’ll leave the blow-by-blow for her report. She had a remarkable run. 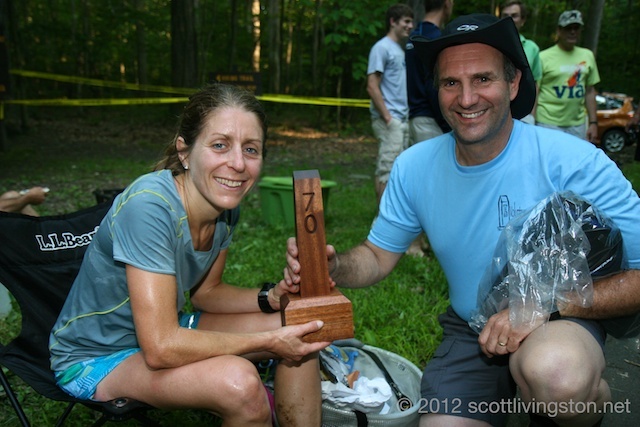 She had a good, but unremarkable (compared to this year) run at the modified 2011 Laurel Highlands Ultra. The race was 77 miles, 6.5 longer than usual, because of an 8 mile road detour to get across the interstate highway. This year, the new foot bridge was in place, and the Laurel Highland Trail was once again a continuous 70 mile thread. She was still breastfeeding our daughter at this time last year and she was only a year and a half into her “comeback” after having our second child. She really wanted to return to the Laurel Highlands and give this race another crack. She felt like there was unfinished business and she wanted to experience the true course, which is nearly all single track, and tailor-made for her technical skills. 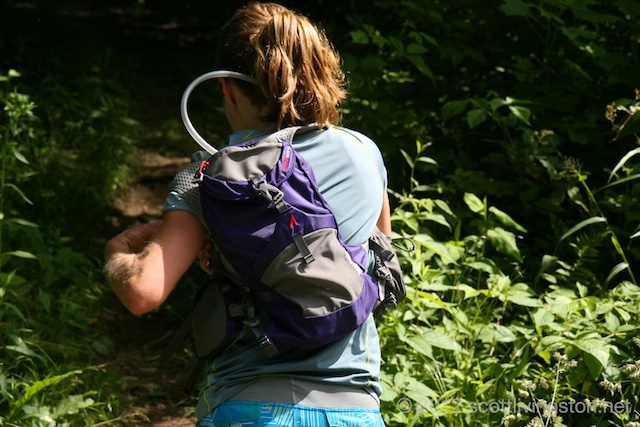 Her Suunto watch registered 10,600 feet of elevation gain. 123 solo runners started the hilly 70.5 mile event. The race results show that there were 85 official finishers. There were nearly 25 teams (4 or 5 runners) in the popular team relay division. There was also a 50 kilometer race for both individuals and teams. I don’t have the 50K results yet, but I’ll post when they are available. The 50K started at 7:30 A.M., two hours after the 70.5 start. This year, she only needed her headlamp at the start. Her scorching fast pace and the “no-detour” route had her in Seward at the northern terminus just after 7:00 P.M. The kids and I only had a few hiccups. 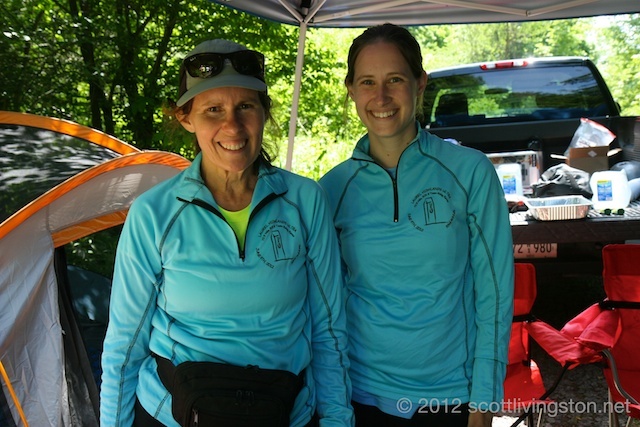 I crewed for Debbie in late April at the Zane Grey 50 Mile Endurance Run. That was a solo job, and what a difference! Looking after a 5 and 3/4ths year old (as he likes to put it) and a 2 and 1/2 year old while also looking after Debbie is a big task. I’ve done it many times, and I’m only complaining a little, but a point to point race is an additional challenge. We stayed at Ohiopyle State Park like last year. It is a great spot only 3/4 mile from the start of the race. Our “crew” only had two real mess up’s. There are seven crew accessible checkpoints/aid stations. We skipped the Maple Summit Rd. aid station at 11.6 miles because it was too early. Debbie ran down to the start after getting up at 4:30 A.M. I saw her off and eventually got the kids awake, dressed, and fed. We first saw her at the Rt. 653 Checkpoint at 19.3 miles. She was looking good. It was mostly uphill climbing to that point. We saw her again at the County Line Road crossing aid station at mile 28. Our first mess up came shortly thereafter. Checkpoint #2 at Rt. 31 is only 4 miles farther up the trail at 32.3. We made it last year, but his year, our packing and unpacking skills weren’t as good. We hauled all the gear, food, ice, and stuff down a short trail to the aid station when we learned that we missed her by three minutes. She was clearly running faster than 2011. Ugh! I heard that she just tore through the aid station, only stopping for a cup of water, so I crossed my fingers and hauled the kids back to the van. We met up with her again at Linn Run Rd./railroad grade at Laurel Summit State Park. We weren’t there long when she came flying through. She changed her shoes and socks, swapped her Ultraspire hydration vest (she has a matched set and we alternated all day long), and was on her way again. 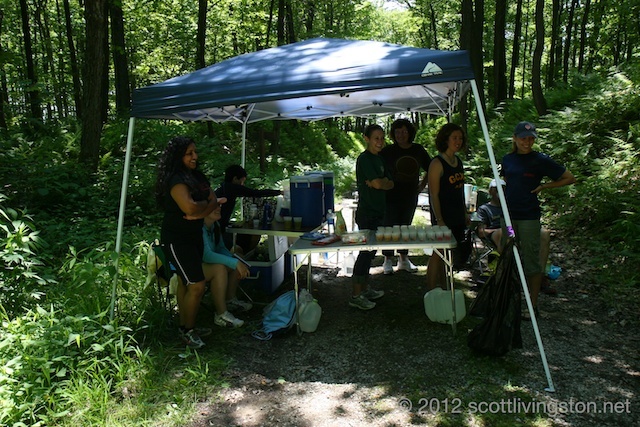 All of the aid station volunteers were terrific. Several volunteers, fellow crews, and even relay runners helped me haul gear and watch the kids throughout the course of the day. This race has a great community vibe. We hightailed it on the dirt roads of the state park over to Checkpoint #3/Rt. 30 aid station at 46.4 miles. We ran into Amy Lane, who was 2nd woman in the 50K. She was chasing down partner Brian Rusiecki. The kids and I saw him for a brief moment at the second aid station, and then he was ahead of us the rest of the day. 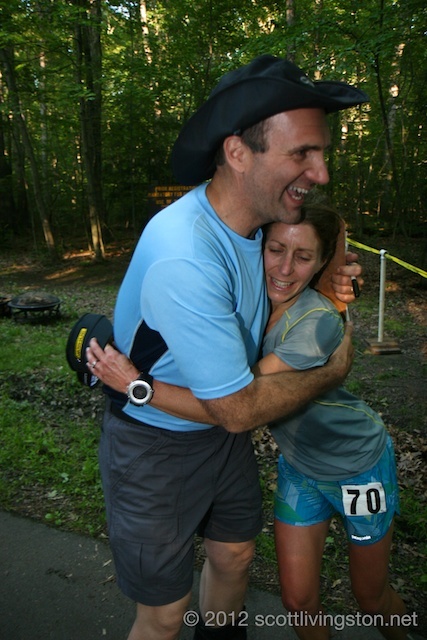 Amy missed him at 46.4, but she helped me get the kids to the aid station in time to see Debbie. Debbie didn’t stay long, and she was still looking strong. My second mess up came during the prior stretch of trail. Evidently, I neglected to refill her Hammer Perpetuem flask, but she survived. I filled the hydration pack, added salt tablets, gave her some gels, but forgot to fill that flask. I was bummed out, but she took it in stride. 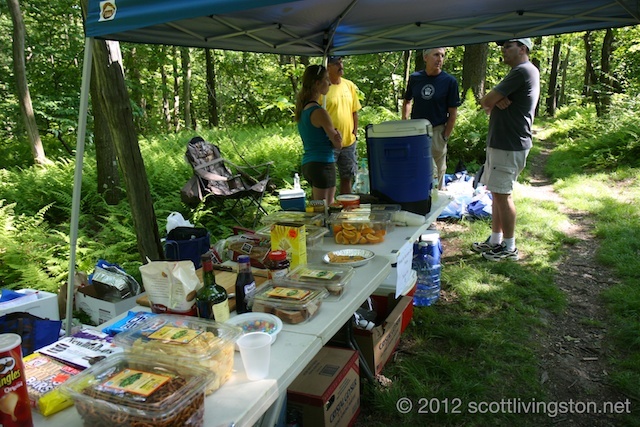 We took our time packing up because the final crew accessible aid station was Checkpoint #4/Rt. 271 at 57.3 miles. We had more than two hours to get there. We drove down the mountain and stopped in the quaint revolutionary town of Ligonier. We drove by the old fort, and then parked just off of the “diamond” (town green). The whole town was set up for an antiques show. The displays were really cool and the kids had a blast. We sauntered down to the corner of the green, where we stopped at a coffeehouse and got smoothies and a sandwich. After we got our order to go, we strolled back to the van, and made our way back up the mountain to the ridge. 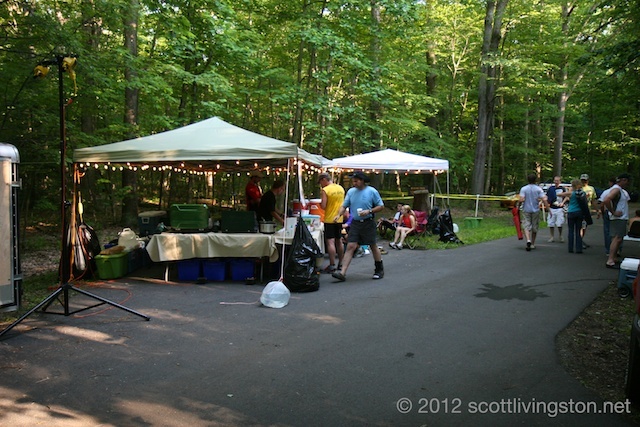 We had time to set up at the aid station, which was a short walk from the dirt road parking. This is when Debbie came through in a world of hurt. I was hoping it wasn’t her fueling, which was impacted by missing that Perpetuem flask during that eight mile stretch. She had been pushing so hard, but she was definitely in a lull. We switched her pack again. She sat for a minute, but that was it. She got right back up and headed out. I walked up the trail with her for 50 yards and gave her a pep talk. I crossed my fingers and she was off running again. A couple of guys rolled into the aid station minutes after her. I encouraged them to chase her and offer encouragement. She had been moving her way up through the men’s field all day long. Little did I know that she had been “doing the math” throughout the course of the race, and she was on a mission to attack the course record. She kicked it into high gear over the last thirteen, while I took the kids to Johnstown and stopped at a cool restaurant. We ordered two pizzas to go, used the potty, and then headed for the finish. 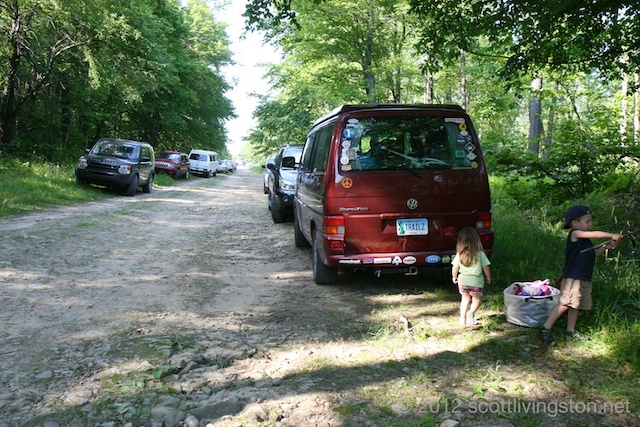 We got the van situated and then set up near the trailhead. Debbie surprised all of us. She came blasting into the finish while I was over at the van, fetching some snacks for the kids. I heard the cheers of the crowd and rushed over to see her ecstatically celebrating. It was a cool moment. She caught all of us off guard, including the co-race director, Rick Freeman. He shared the great news about the course record. He was as thrilled as we were. He introduced us to Ted Massa, who preceded Tim Hewitt and him as race director. 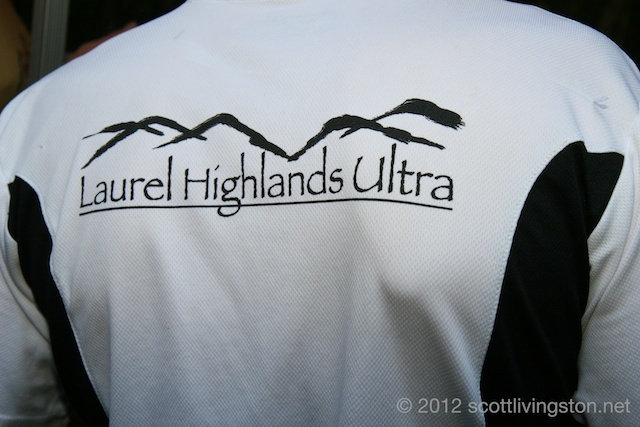 We learned a bit about the Laurel Highlands Ultra. 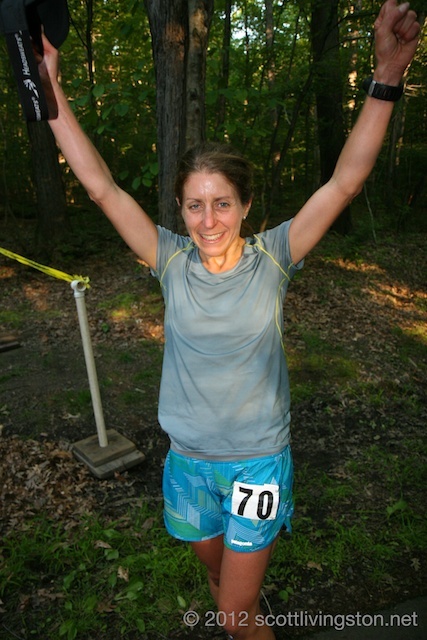 The RD’s were pleased to hear that Debbie has been RD of the Soapstone Mountain Trail Races for 11 of the 28 years. The Shenipsit Striders share some of the same pedigree as the guys and gals who put on Laurel. Soapstone, the NipMuck Trail Marathon, and Laurel Highlands all have great history of 28, 29, and 33 years respectively. Overall, we had a fantastic time supporting Debbie. She ran an inspired race and we were inspired! Last week, at the Rev 3 Quassy Half triathlon, she supported me. This week, It was my turn to return the favor. She didn’t have any falls. She only had one small blister and a little toenail problem. She made good use of caffeinated gels in the last half of the race. This is really a breakthrough run for her. She has put so much hard work in over the last two plus years. I want it to translate into future success. This is a new level for her and she is anxious to go up against top women’s fields (like at Zane Grey) in future races including the Hardrock 100 (she lost out in the lottery this year) and maybe Western States 100. Under the guidance of Coach Al Lyman and Dr. Kurt Strecker from Pursuit Athletic Performance, she has put a lot more structure into her training, and it has paid off. Next up for us is the Mt. 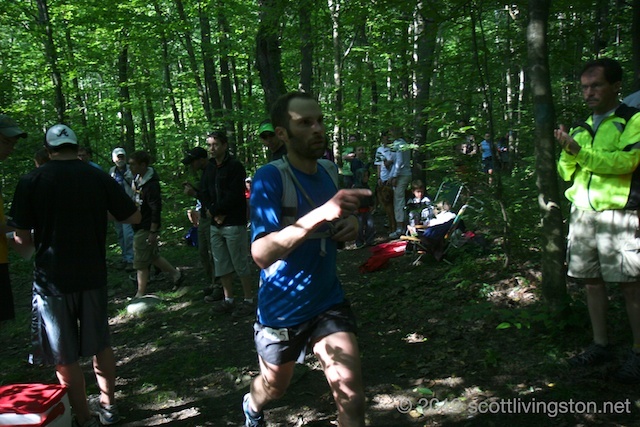 Greylock Trail Race in Adams, Massachusetts, a Father’s Day tradition. Debbie has run it 13 years in a row, and I don’t anticipate that she will miss number 14, despite sore legs. At 14 +/- miles, it’s a baby run! Debbie posted her own race report. Great report from the support side of things, Scott! Thank you for taking the time, as always. Deb really is such an inspiration! I’m so grateful to have the opportunity to coach her, and watch her grow and grow as a runner. Onward and upward! Congratulations to Debbie and Scott, to you and the kids! What a fantastic accomplishment. Just Amazing!!! Wish we were able to connect over the weekend. Enjoy! !